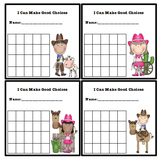 This simple daily behavior chart is easy for the teacher and student to use. Focused behaviors are sitting still, raising hand, and following directions. Students will write a short sentence of what they did well today, and what they hope to do tomorrow. Simple easy to use daily behavior chart. Edit it towards your personal schedule or for individual learning/behavior goals. This is a super simple tool to use for our younger kiddos to help manage how they did during an activity. You could fill this in with them following each activity, or ask them to fill it in and you do the same and compare and discuss it afterwards. Hope this helps! This is a simple behavior chart with the colors purple, green, yellow, and red. It can be used in the classroom to help with classroom management. I hope it helps! Enjoy! Student chooses a reward and must earn 5 stars to receive it. Five types of rewards are included in this product (bean bag chair, teacher's helper, iPad, legos, and stickers). This product is editable! This is a simple behavior chart. Please let me know if you would like some modifications made to it, and I can do my best to help! This behavior chart allows teachers to collect data and information on student behavior. The chart can be edited to suit individual needs and IEP behavior goals. Students can also track their own behavior and data. 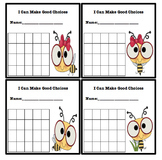 Simple behavior chart for elementary or special education students. Simple behavior chart in Spanish.